The Amazing and Easy Chicken Wings recipe from Allrecipes.com and Bon Appetite's Bourbon-Glazed Chicken Drumettes are some simple recipes for chicken wings. Each recipe has a short ingredient list and requires minimal preparation time. Make the Allrecipes.com version by mixing 2 cups of brown sugar, 1 cup of yellow mustard and 1/4 cup of soy sauce in a small bowl. Separate 1/4 of the mixture and put it in a small bowl, cover and refrigerate it for basting later. Toss 5 pounds of wings with the marinade in a large resealable bag and refrigerate anywhere from 2 hours to overnight. 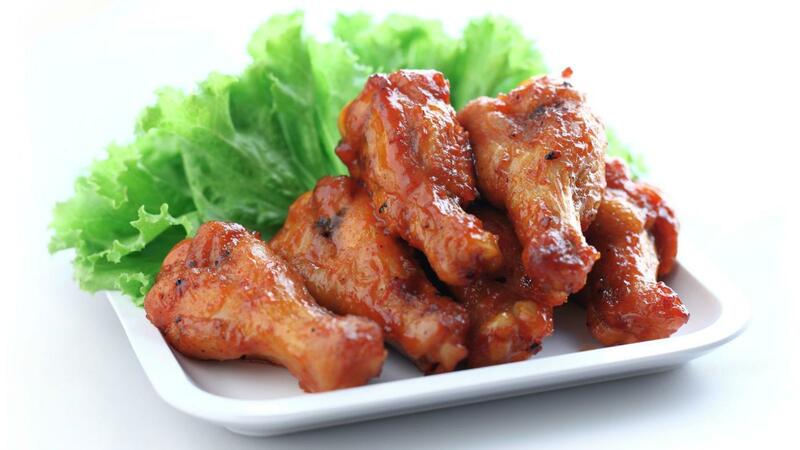 Place the wings on a baking sheet and discard the bag and remaining contents. Bake the wings at 375 degrees Fahrenheit for 30 minutes and then baste them with the reserved marinade. Return the wings to the oven for about 30 minutes more or until the meat is no longer pink. For the bourbon-glazed wings melt 2 tablespoons of butter in a large, heavy saucepan over medium heat. Add 1 large chopped onion and 3 peeled and thinly sliced garlic cloves and saute until golden. Mix in 3/4 cup of bourbon and boil for 6 to 8 minutes or until most of the liquid is absorbed. Whisk in 1/4 cup of ketchup, 1/4 cup of bourbon, 1/2 cup of your choice of hot pepper sauce, 1/4 cup of tomato paste and 3 tablespoons of firmly packed brown sugar. Bring the mixture to a boil and then reduce it to a simmer, stirring occasionally, for about 10 minutes. Remove it from the heat, add salt and pepper to taste and let cool to room temperature. Place 4 pounds of wings on a baking sheet or in a dish and coat with the glaze. Bake at 375 degrees Fahrenheit for 45 minutes. What Are Some Crispy Chicken Wing Recipes? What Ingredients Make up the Best Buffalo Chicken Recipe?